When beginning to research your family history and build your family tree the best place to start is with the living members of your family. Visit the elderly family members first and ask them of their memories from their childhood. Take notes and check the spelling of unusual names and dates. A voice recorder and even a video reorder will not only help you note down every detail but will be a lasting memory of members of your family. 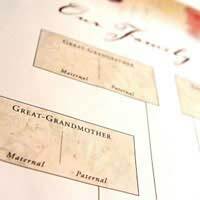 If you feel that the task is too daunting there are genealogists who can be employed to use their genealogy knowledge to build your family tree and chart its roots into the past. If you could arrange a family tea party for the older members of the family you would find that the memories would flow and prompted by each other more memories will emerge. You may find that the family surname has changed in its spelling over the years or derived from a profession or important place. As you interview each of your family members ask to see their photograph collections. With modern technology it is easy to scan copies or even photograph them with a digital camera or a mobile telephone. Make a note of all the people in the photograph, the occasion, and the setting. The photographs will not only make a pictorial history of your family but may also keys to more information about your family. Look at the background of the photographs it may show a family business or the name of a motor vehicle, fashions of the era that shows the status of the family and where they lived. Starting with your own name work back in time with first your parents and then your grandparents showing the dates of their birth, marriages and if relevant their deaths. This is often called the 'family tree' and as you build on the information about your own family you will see the information grow and grow just like a tree. It is possible to visit the Public Record Office in London and research further into your family's history. Armed with just the name and approximate age of say your great grandmother you will be able to trace back and find when she was born, married and died. By purchasing copies of the birth, marriage and death certificates you will glean much more information about your relatives that enable you to trace even further back in time. The records in the Public Record Office go back as far as 1830 and are now available on line for those not able to visit London. Make a point of visiting churches local to your family' home as you will possibly find information about long dead relatives on gravestones and in church records. Public census records are available for those interested in their family history and much about the social status and living conditions can be told from these records. It is possible that there will be mention of your family in local newspaper archives. If they were business owners or participated in anything newsworthy whether it was in politics or a disaster there could be records and indeed photographs of long lost relatives. Many towns now have their own museums and the curator and staff will be more than happy to aid you in your search. Make an appointment to visit them and take your research notes with you along with any photographs as not only will they be interested in your project but may be able to notice things that you have missed. Look for any references to the surnames that occur in your family tree as these people could be part of your ancestry. Many areas of the country have local history groups and by joining a group in your town not only will it aid your family history research but will give you further insight in to how those in days gone by lived.